Zuken and CADENAS have announced a partnership to strengthen their competencies, by providing users of Zuken’s E³.series ECAD tools direct access to online component libraries. The partnership was announced at Zuken’s global customer conference, Zuken Innovation World, in Yokohama, Japan, running from 18-19 October. The partnership strengthens the core competencies of Zuken and CADENAS. Users of Zuken’s ECAD environment, E³.series, will gain direct access to the CADENAS component portal, where they can search for components from a broad range of manufactures and load the required parts directly into E³.series. This will offer ECAD users a vast range of parts to choose from, as the CADENAS portal currently hosts library data from more than 800 manufacturers. E3.series is a true concurrent electrical engineering environment, supporting advanced requirements for electrical documentation, cabinet, wire harness and fluid design. Visitors at Zuken Innovation World were the first to see how users can search the CADENAS component portal, find a suitable HARTING connector, and download it directly into their design. HARTING is the first component vendor to actively support the new CADENAS-Zuken interface, providing component information for ECAD applications to customers. The HARTING Technology Group is one of the world's leading providers of industrial connection technology for the three lifelines of Data, Signal and Power and has 13 production plants and branches in 44 countries. Moreover, the company also produces retail checkout systems, electromagnetic actuators for automotive and industrial series use, as well as hardware and software for customers and applications in automation technology, robotics and transportation engineering. In the 2016/17 business year, some 4,600 employees generated sales of EUR 672 million. Zuken is focused on being a long-term innovation and growth partner. The security of choosing Zuken is further reinforced by the company’s people—the foundation of Zuken’s success. Coming from a wide range of industry sectors, specializing in many different disciplines and advanced technologies, Zuken’s people relate to and understand each company’s unique requirements. For more information see: www.zuken.com. 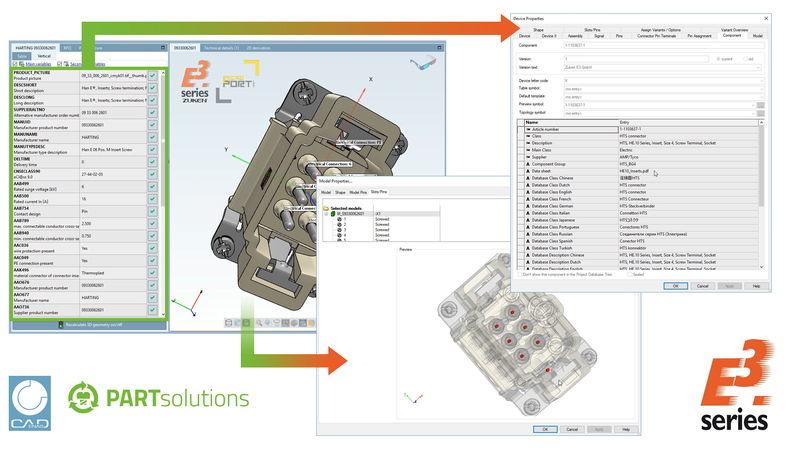 CADENAS is a leading software developer in the areas of Strategic Parts Management and parts reduction (PARTsolutions), as well as Electronic Product Catalogs (eCATALOGsolutions). With its customized software solutions, the company acts as a link between the component manufacturers with their products and the purchasers. With its 320 employees at 17 international subsidiaries, the name CADENAS (Spanish: process chains) has been standing for success, creativity, support and process optimization since 1992. ECAD-PORT is the service partner for the E³.series component database. From the creation of specific parts to review and optimization of existing libraries to our premium full-service database hosting we support E³.series customers in all database related aspects.